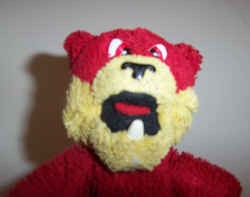 Fang is the red bear, with yellow face, paws and feet. He wears blue shorts. The "nice" face wears a blue and yellow school cap, and the "evil" face has a single fanged tooth in the middle of his mouth. His story features the bears foiling a gang of diamond smugglers. Fang uses his tooth the deflate the tyres on the gang's getaway car before feigning an old man's voice and phoning the police to inform them that the car is parked illegally.